Ex-mayor of Leicester, England; born 1835. 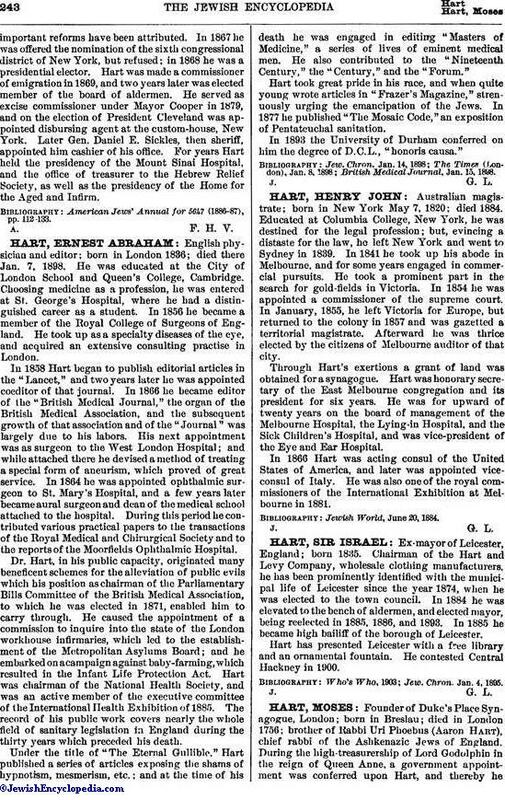 Chairman of the Hart and Levy Company, wholesale clothing manufacturers, he has been prominently identified with the municipal life of Leicester since the year 1874, when he was elected to the town council. In 1884 he was elevated to the bench of aldermen, and elected mayor, being reelected in 1885, 1886, and 1893. In 1885 he became high bailiff of the borough of Leicester. Hart has presented Leicester with a free library and an ornamental fountain. He contested Central Hackney in 1900. Jew. Chron. Jan. 4, 1895.